For us dog owners, places that allow us to bring the pup along automatically jumps to the top of the list of our favorite places to go. Denver is know as one of the most dog friendly cities (if not the most), and we absolutely love it! We compiled the best dog friendly bars for you and the pup. This bar has it all. They have great beers (try their local red ales), live music, quality food, but most importantly, they let the pups tag along. This year marks their 5th year Anniversary so they have been around the block. This is a go to for Denver locals looking to have a night out. Fun fact: They are actually featured in the documentary "Crafting A Nation" that talks about the local and national brewery craze. Specials: $25 all you can drink open to close <-- WHAT?! Not the most wild bar, but it's by far the most dog friendly on the list so we had to include it. This bar is great to just chill and bring the pups with. The bar is basically made for dogs so you know it will make your puppy happy! This low key has one of the best specials we've seen. $25 dollars all you can drink from open to close. We did the math for you, that is 13 HOURS of drinking on a Saturday. Hey. Now. Dogs are absolutely welcome. You can even reward your dog for coming out with you with some specially made treats. 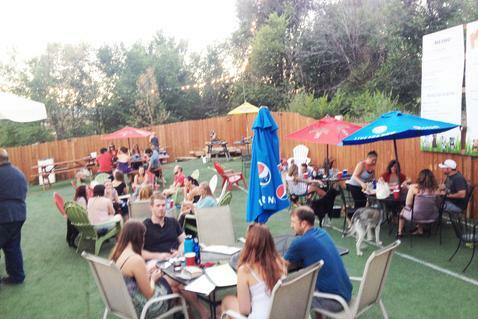 The beer garden offers a fun, laid back vibe, which is the perfect place to spend an afternoon. As for the beer selection, you can't be called the Denver Beer Company if you can't back it up. There are no happy hours, but the beer is always flowing and there’s usually a crowd. Inside has a large bar and outside there’s a patio. They do not serve food, but there’s a local food truck out front daily. This is a really cool vegetarian place with some really creative dishes. Don't be fooled though, your pups will be able to enjoy the greens right next to you on the patio. This is more of a great place if you are feeling a little "exotic" and want to switch up the 'ol routine. It is considered one of Capital Hill's best kept secrets. Their beautiful patio allows dogs leashed on the outside patio area, and City O’ City is kind enough to lend some water for them. They pull a full day, opening early and closing late, and have amazing food throughout the day. They are known for their ‘Waffle of the Week’. The patio is overlooked by one of the coolest murals in Denver! Located directly across from Governors Park (two governors have chosen this watering hole to host their acceptance speeches), this bar is great if you need to bring the dog with. It is a great place to kick it back with friends without getting too rowdy and embarrassing yourself in front of your dog. Locals flock here because of the great happy hour deals, but you can definitely find yourself passing the time playing with other puppies. 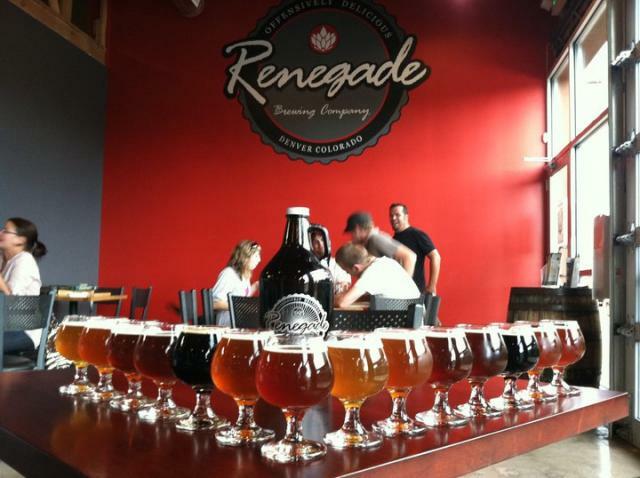 There is nothing normal about Renegade Brewing Co and that is exactly what they want. Their own motto says to be a renegade. Renegade's mad scientists are accustomed to making unique brews that are surprisingly incredible. The list includes everything from IPAs to dark stout, and the taproom offers different specials for every day of the week. If you get hungry, they have rotating food trucks right outside where you can grab a bite to eat. Oh, and they are totally cool with letting your dog kick it back with you, but prepare for the visitors of the bar to flock to your pup! Forest Room 5 has an awesome atmosphere with a patio. Surrounded by trees, a stream, and fire pits you’ll be at one with your outdoorsy side when you come here. Plus your pup is sure to love this outdoor nature vibe. With $5 drinks and cheap apps during happy hour this is a great spot to come chill after work without having to feel bad leaving your four legged friend at home.